If you’re running a small or medium-sized business, then you’ll know just how important it is to use an online accounting tool. Preferably one that keeps everything organized in one place, records your sales, tracks your spending, and can hook up with your bank accounts to make sure accurate and up-to-date information is at your fingertips. QuickBooks Online is one such tool, used by millions of small business around the globe. And it’s a very good choice when you’re handling most of the day-to-day tasks of running your company yourself. But as your business grows, you will need to start delegating tasks. And one such task that always crops up is the creation of Purchase Orders. This typically requires granting your employees access to QuickBooks Online, therefore allowing them a first-hand glance at information that may well be above their paygrade. So, how do you manage this situation? How do you control access to sensitive information, and manage the approval of POs before they are sent? ApprovalMax is an approval workflow platform designed to cover specific financial approvals, including the creation and approval of POs. It gives financial managers the power to select who should create and approve POs, and under which criteria they should be approved. And we are very proud and excited to present ApprovalMax for QuickBooks at the upcoming QuickBooks Connect 2016 conference. ApprovalMax for QuickBooks introduces security and compliance into the purchasing process, but without the many “bells and whistles” that can often make purchasing difficult. 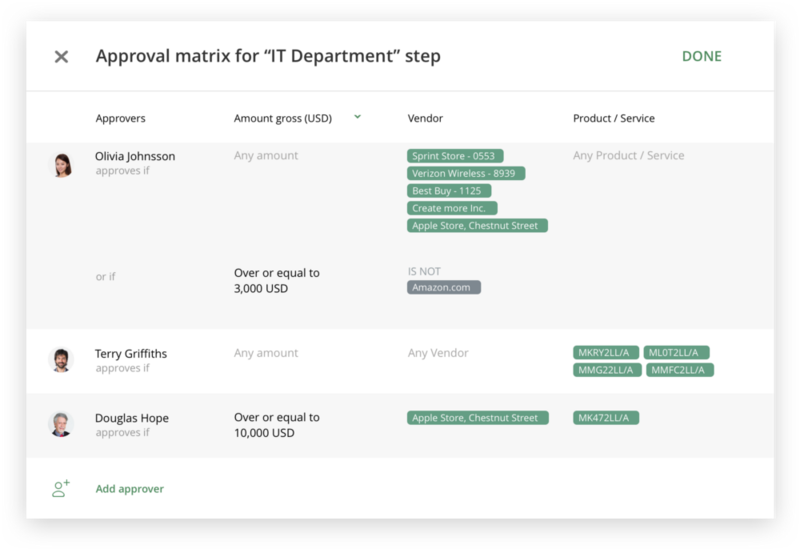 You will be able to simply create a Purchase Order within ApprovalMax, have it approved, and then push it to QuickBooks. There is no need for employees to access QuickBooks Online, keeping everything safe, secure, and on track. Requesters and approvers of Purchase Orders do not require logins for QuickBooks Online. This keeps your important accounting data safe and secure from those who do not require access. And even more control can be exerted, as PO creation can be restricted to certain suppliers and products/services. By using ApprovalMax for QuickBooks, you will enjoy a better level of compliance within your business. It will make sure that POs are always approved by the relevant managers, and that every PO-related action is accounted for, thanks to PDF audit reports and a full audit trail. 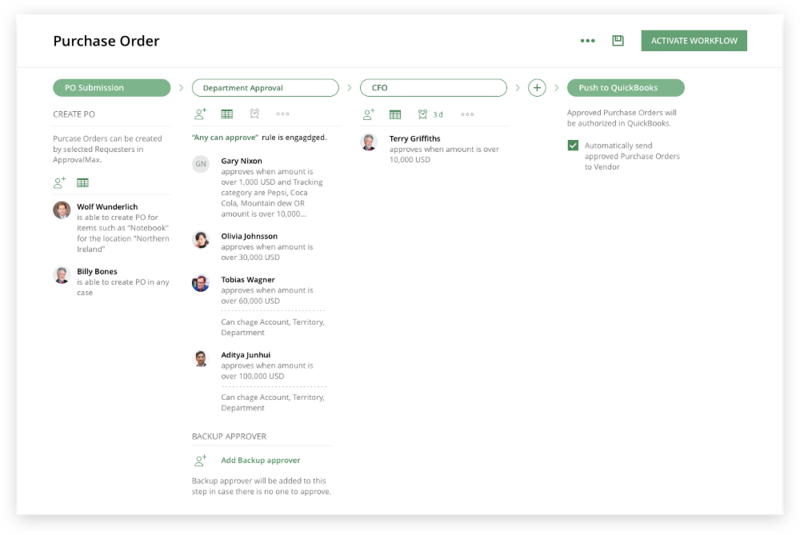 Managers are instantly notified of new documents sent for approval. What’s more, they can approve POs from within their email, or via our smartphone app (available for both Android and iOS). Requesters too will be notified about the status of their PO; they’ll know if it has been approved or rejected, and if it’s the latter, they’ll receive feedback as to why. Approvers will enjoy the clarity and accuracy of ApprovalMax for QuickBooks. They’ll be able to check if a particular Bill is related to an earlier PO, and be certain that the amounts and details match before approving the payment. ApprovalMax for QuickBooks will transform your purchasing process, and keep your financial data from those not privy to it. It’s a win-win. Note: Only QuickBooks Online for US is supported. If you are interested in seeing support for ApprovalMax for QuickBooks in another location, please let us know. Do you have questions? Email us at info@approvalmax.com or register for our next webinar.